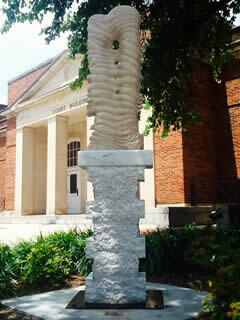 Raleigh Little Theater Commission Completed and Installed! 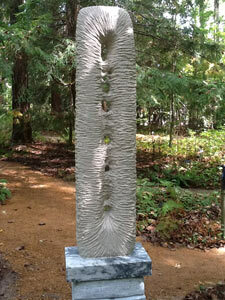 This work was commissioned by Brian Shawcroft and Kathleen Gruer. 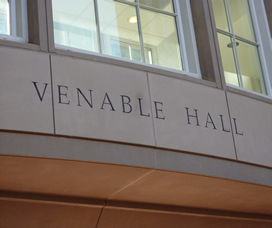 More information coming for the dedication ceremony. 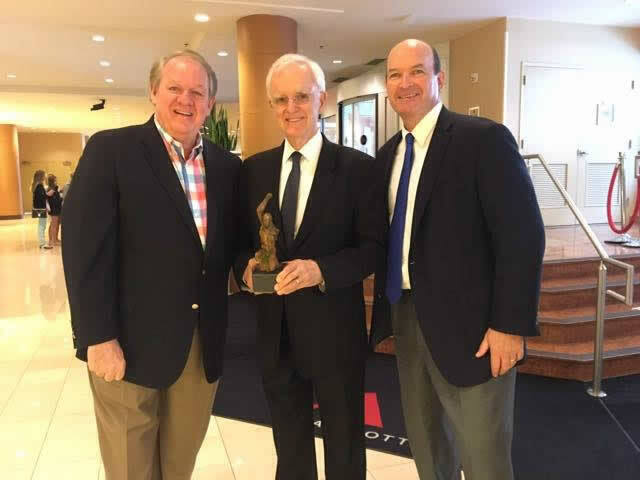 A work of mine being presented to the former Nebraska governor and senator Bob Kerrey, By George Breece on behalf of th National Association for Advancement of Orthotics and Prothetics. 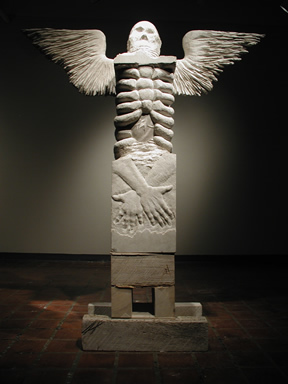 "Icarus Stelae, the Rise and Fall "
Carved limestone, granite and gilding. 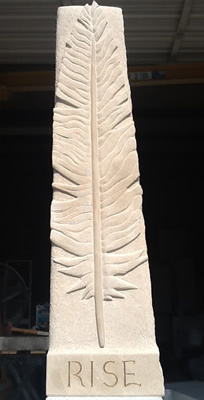 Newly carved work heading to Bristol, Virginia/ Tennessee ( there is a line down the middle of Main Street separating the two states) as part of the Art in public places project. 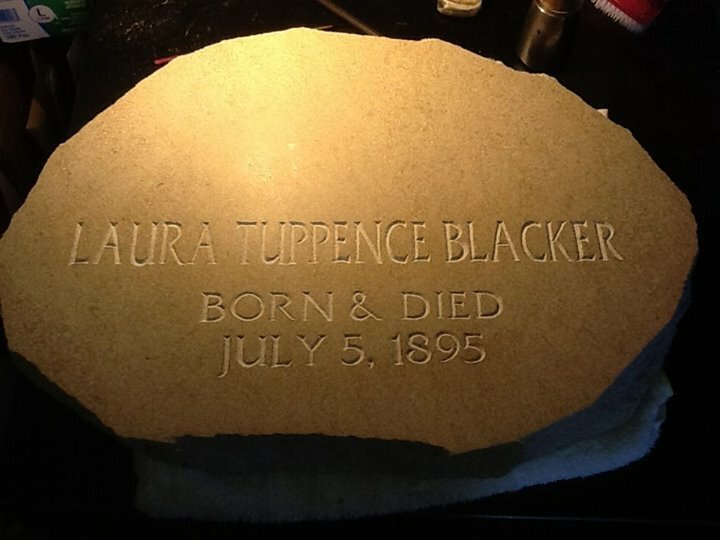 Private memorial completed, carved in very hard but beautiful Cherokee Crystal marble. This stone is famous for its brilliant glittering surface. Moved an older work, I think from about 20 years ago. 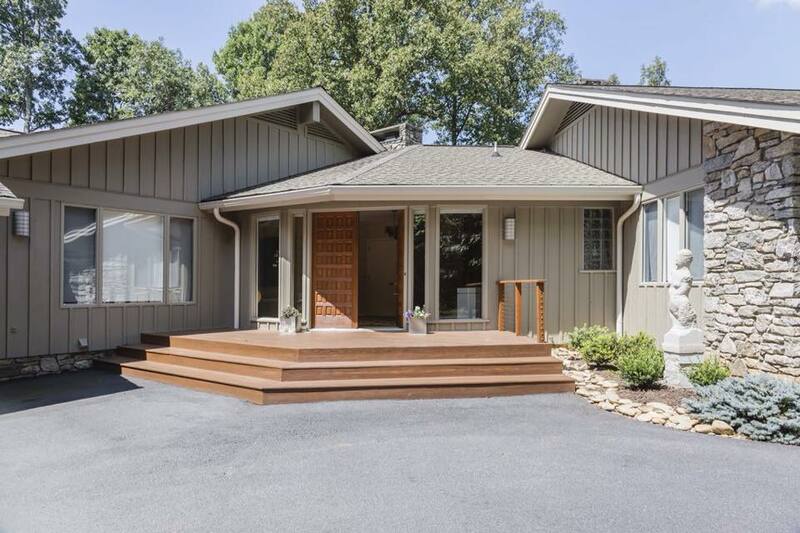 Client purchased a new house and wanted "His" sculpture to move along with him. I called it "The Way". 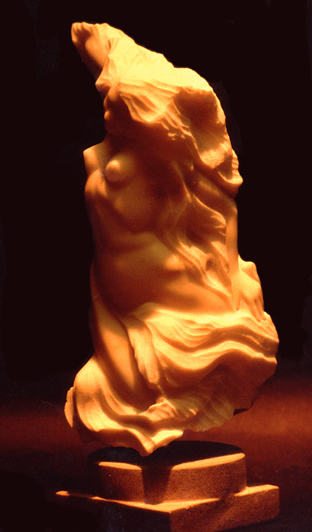 Take a virtual trip back in time and create a sculpture of translucent Italian stone. 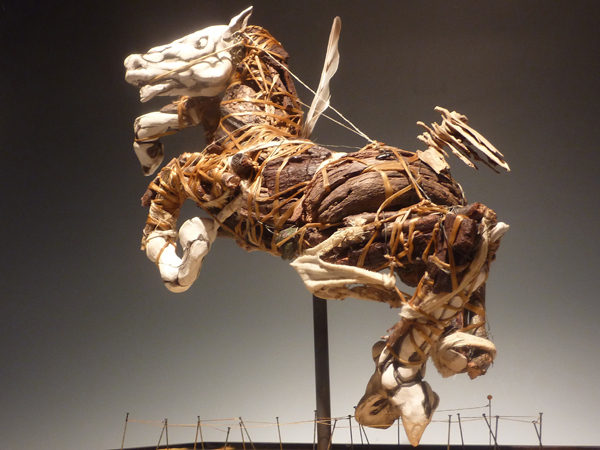 Award-winning sculptor Paris Alexander leads this two-day workshop. His last class sold out, so register early. All materials included. Bring a bag lunch. Click here for images of previous student work. 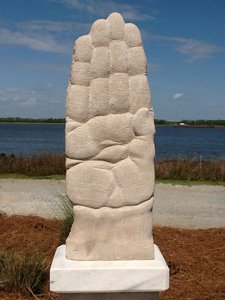 Summer 2015: "Portal VIII " installed at River Front Park in North Charleston, SC as part of the Juried National Sculpture Competition. 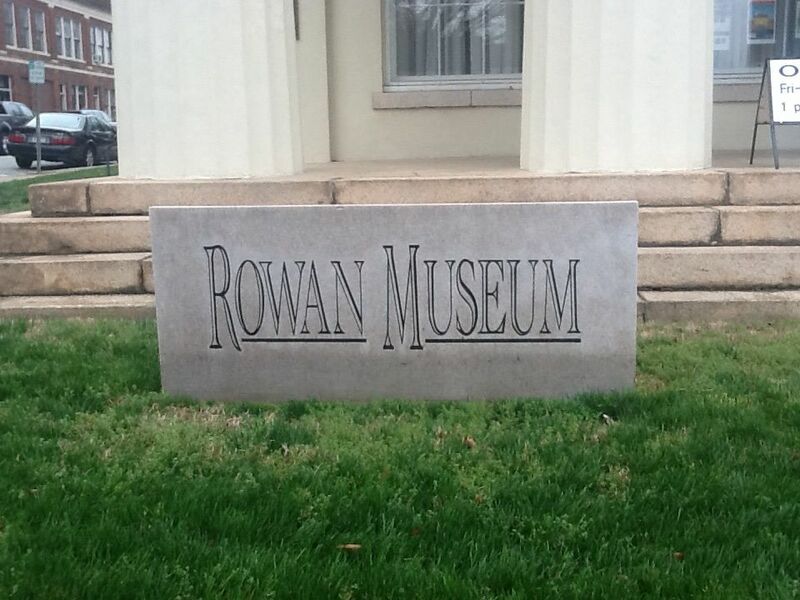 Spring 2015: "Orpheus" installed on the grounds of the Rowan Museum in Salisbury, NC. 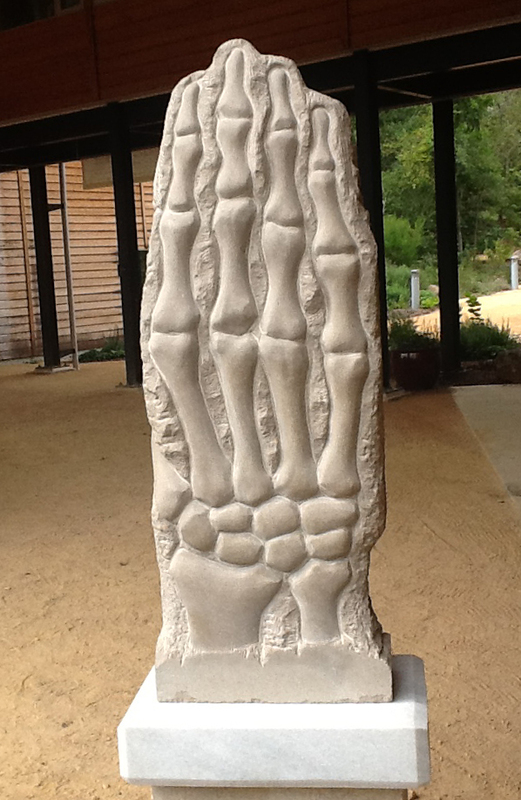 As part of the Salisbury Sculpture Exhibition. 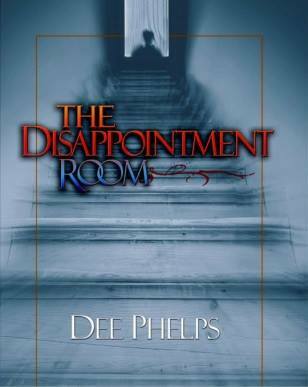 Movie Prop for "The Disappointment Room"
The Disappointment Room starring Kate Beckinsale. Lots of mystery. This carving I did for them is pure fiction. I would NEVER otherwise have posted this image; its just a fictitious character in the movie. Please understand this is not a real child's memorial!!! 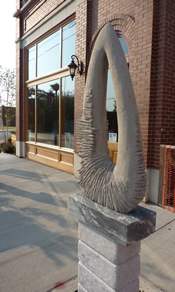 August 2014: "Love Bound w/ Claws ", was awarded an Honorarium for Chapel Hill, NC's Annual Juried Outdoor Sculpture Visions Exhibition. 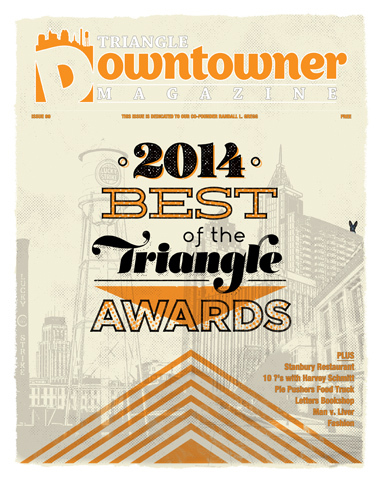 Great Article on Paris by Max Halperen in the Triangle Downtowner! 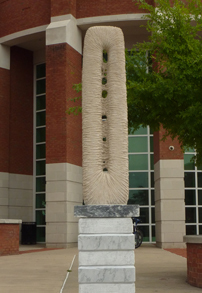 June 2014: "The Burning", was awarded an Honorarium for Kingsport, TN's Annual Juried Outdoor Sculpture Walk Exhibition. 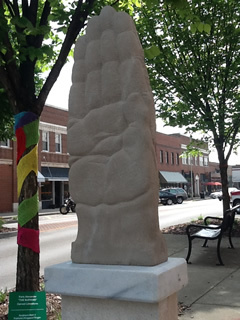 Salisbury Sculpture Exhibition 2014-2015: "Jacob's Ladder", was awarded an Honorarium for Salisbury, NC's Annual Juried Outdoor Sculpture Exhibition. 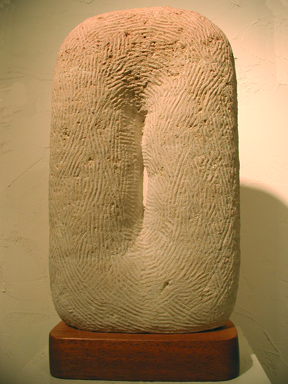 2014 Artspace New Works:"Portal VIII" is a part of the New Works Exhibition. 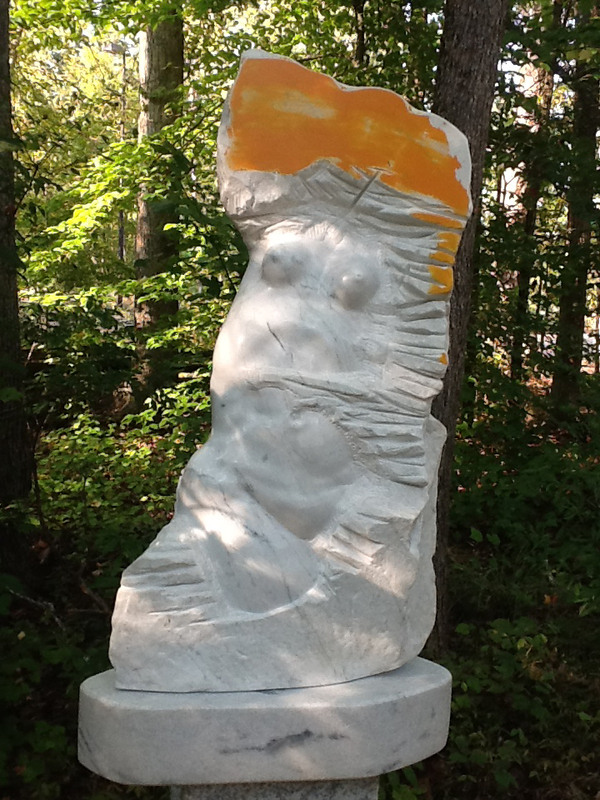 2014: "Nemesis", installed at a private residence in Ashville, NC. 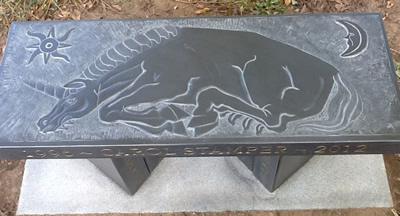 2014: Private memorial installed at Historic Oakview County Park in Raleigh, NC. 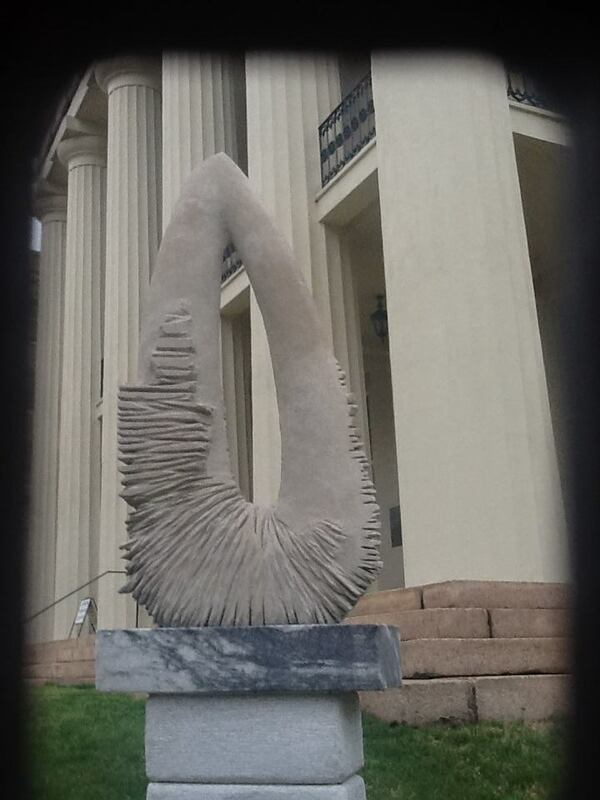 2014 NC Museum of Art: Fayetteville Sculpture Class a Success! N.C. Award-winning artist Paris Alexander lead a group project that will be installed at the Fayetteville Arts Council building. 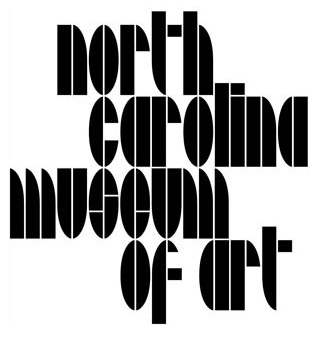 This project is made possible through funding from the Humber Endowment at the NC Museum of Art, the Arts Council of Cumberland County, and the Ellington-White Community Development Corporation. 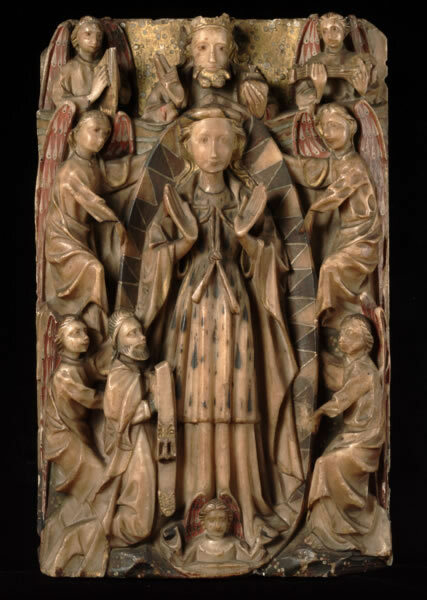 Click here for images of student work. 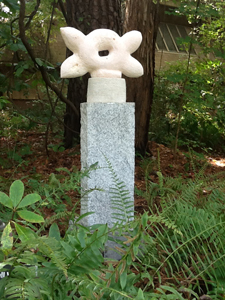 October 2013: The North Carolina Botanical Garden is holding an invitational show of outdoor three-dimensional art interpreting the theme “Sculpture in the Garden.” The show will be held from October 1 to December 8, 2013. 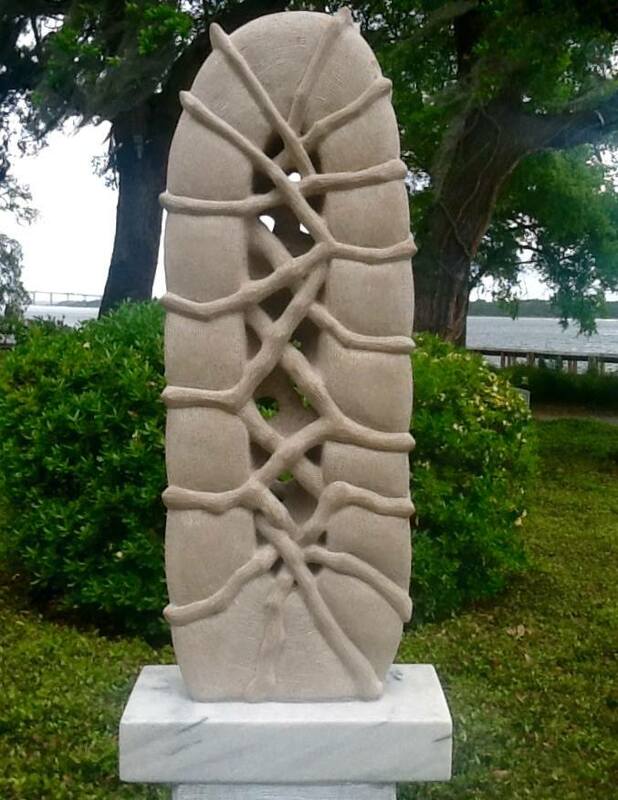 2013: National Sculpture Competition & Exhibition North Charleston, SC , "The Burning "
"Portal VII " was awarded an Honorarium for the Town of Clayton Outdoor Sculpture Trail Exhibition. 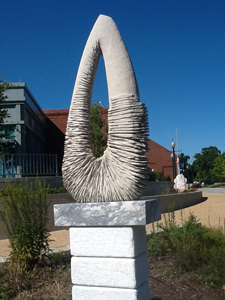 Friday, August 9, 2013 at the Cary Arts Center from 6-8 pm. Click here for more info and tickets to the reception. 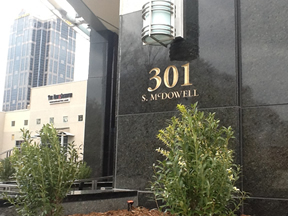 Carved insitu on four street corner locations of the building on Boreal Green Granite. 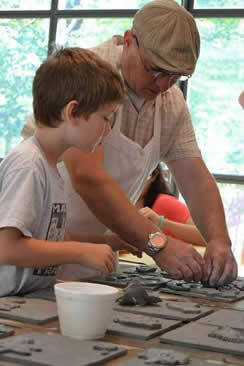 2013: Lecture and Demo with Paris Alexander at the NC Museum of Art! 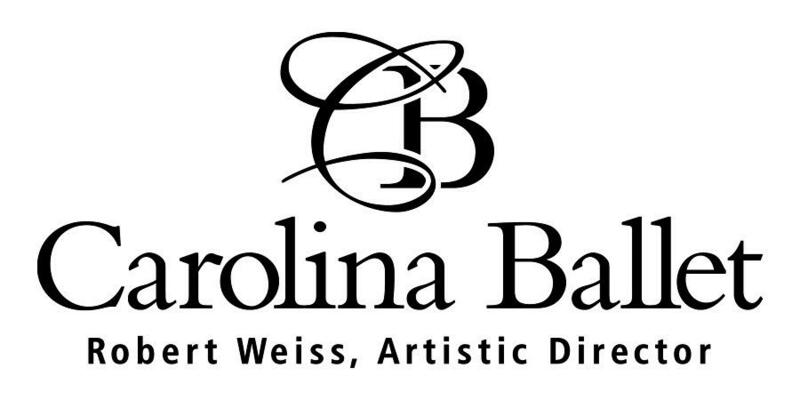 Dinner for 8 with Paris Alexander is on auction for the Carolina Ballet! A truly unique cultural experience of art and eating. 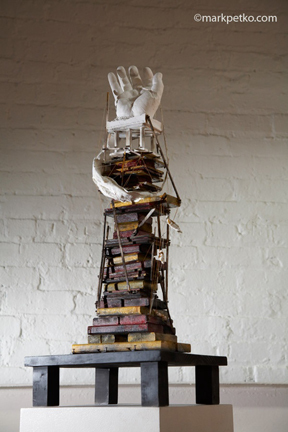 Enjoy a catered dinner by Ladyfingers for eight and one-of-a kind white wine from Tobacco Road Cellars in sculptor Paris Alexander's studio located in Artspace. Paris will present on lecture on his creations and techniques. Cary Visual Art will host its 16th annual Art Ball on Nov. 17 at Prestonwood Country Club in Cary. 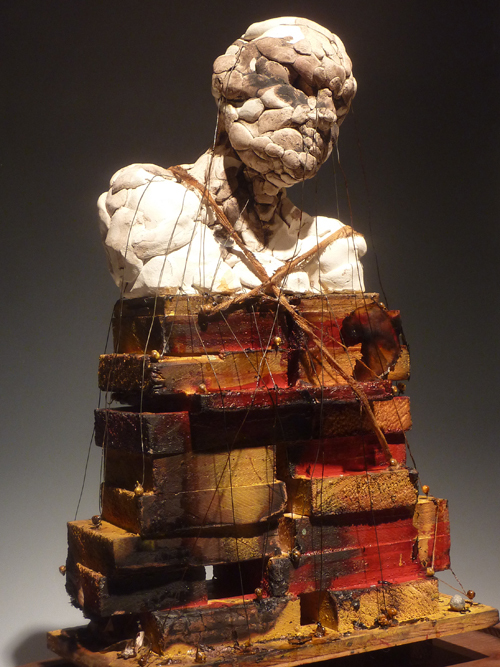 The black tie event includes a art auction and live sculpting by Paris Alexander, who will auction off the finished work during the auction along with many other works by local artists. 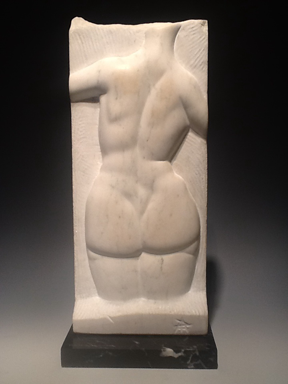 Paris donated "Figure Carving" for Artspace's annual Collector's Gala. It will be part of the Live auction. 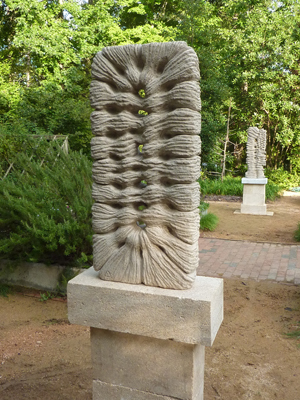 October 2012: The North Carolina Botanical Garden is holding an invitational show of outdoor three-dimensional art interpreting the theme “Sculpture in the Garden.” The show will be held from October 1 to December 16, 2012. 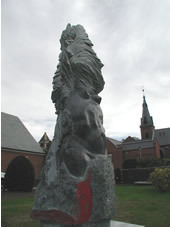 "Le Cure" was awarded third place. 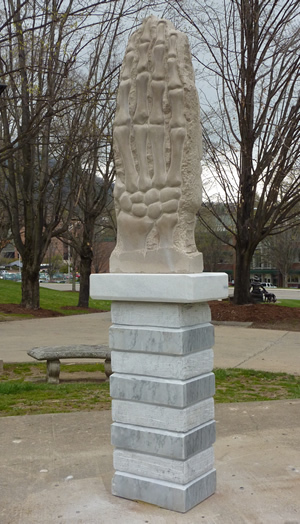 Juried by Jeff York, Public Arts Administrator for the Town of Chapel Hill. 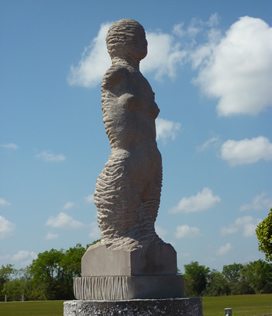 Juried by Ben Hernandez, Co-Curator of the Museum of Contemporary Art Detroit (MOCAD). 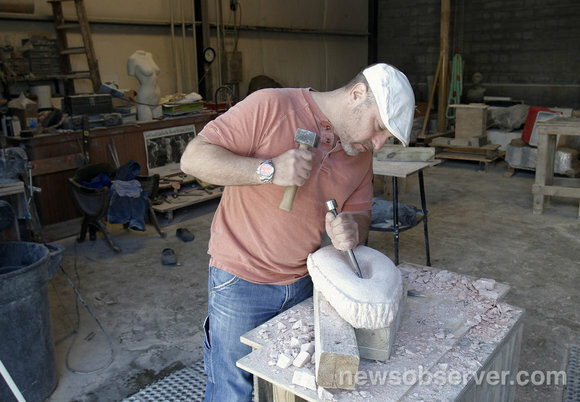 Check out The latest News and Observer Article on Paris! 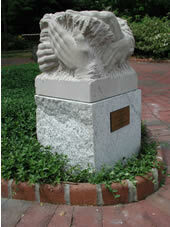 Paris was commissioned to create a series of monuments for WakeMed Hospital's 50th Anniversary. 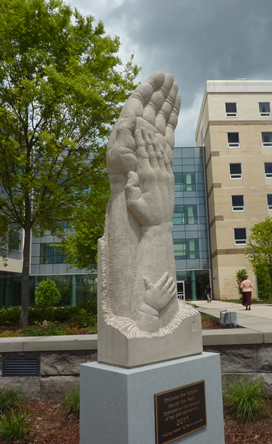 The Monument "Healing Hands" installed in April 2012, is the third of four monuments commissioned by the hospital. 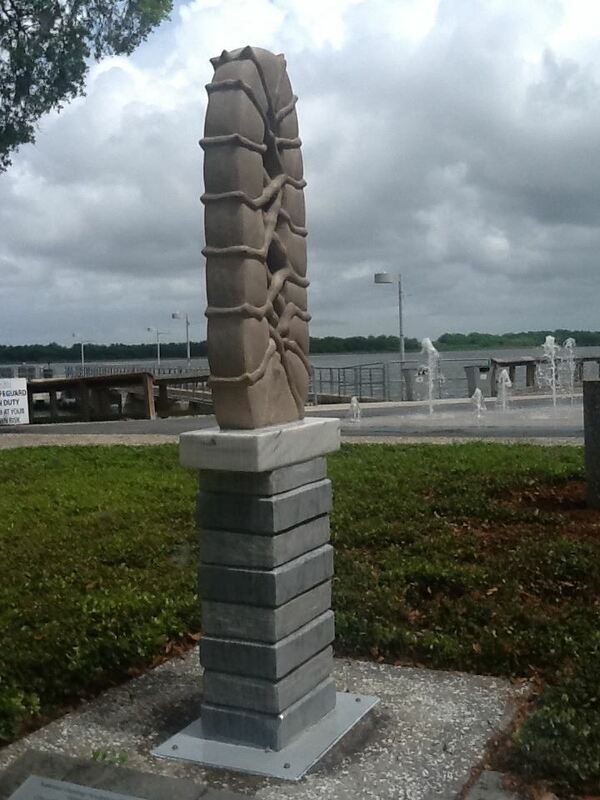 North Charleston Riverfront Park, SC as part of the National Sculpture Competition & Exhibition. 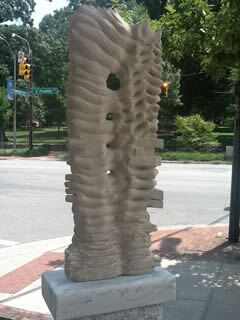 Juried by Steven Matijcio, curator of Contemporary Art, Southeastern Center for Contemporary Art (SECCA). 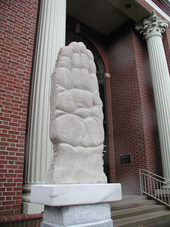 Juried by David J. Brown, the former Chief Curator of the Southeastern Center for Contemporary Art, Winston Salem, North Carolina. 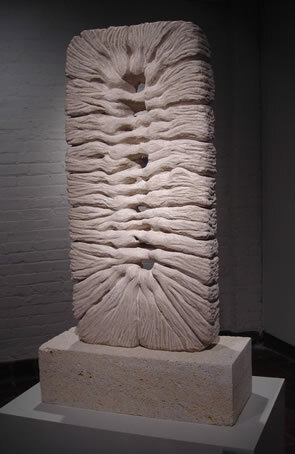 Paris caps off another award winning year with his work "Portal VI" which recieved 1st Place as well as the Solo Show Award in the Durham Art Guild's 57th Annual Juried Art Show. 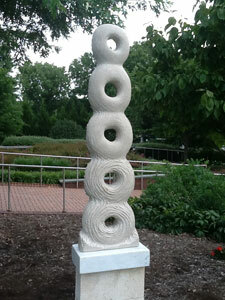 Juried by Linda Dougherty, Chief Curator and Curator of Contemporary Art, NC Museum of Art. 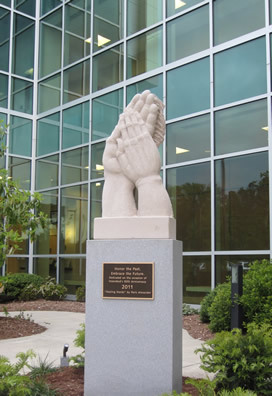 December 2011: WakeMed Cary Hospital Commission Completed! 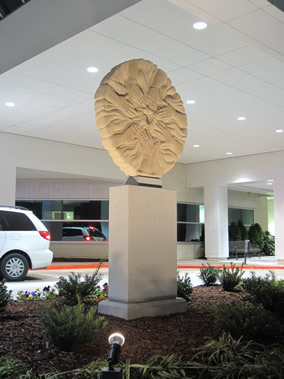 Paris was commissioned to create a monument for WakeMed Cary Hospital's 20th Anniversary. 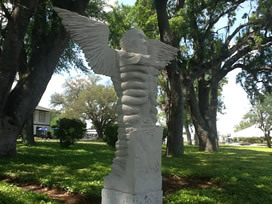 The Monument "Healing Heart" was dedicated on December 2nd. 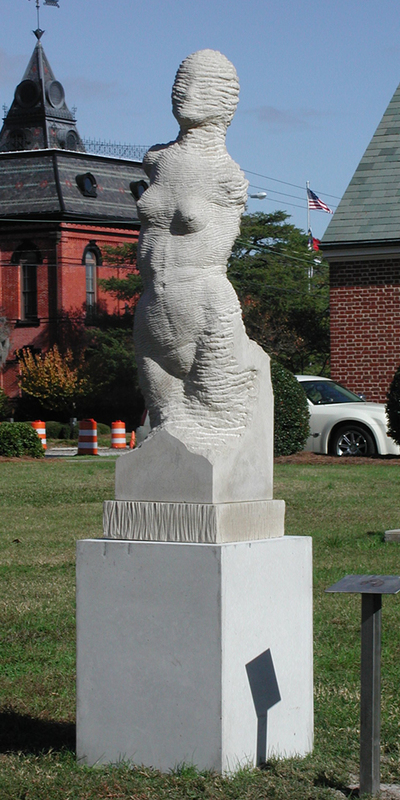 October 2011: The North Carolina Botanical Garden is holding an invitational show of outdoor three-dimensional art interpreting the theme “Sculpture in the Garden.” The show will be held from October 1 to November 19, 2011. 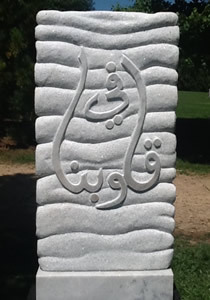 May 2011: WakeMed Commission Completed! 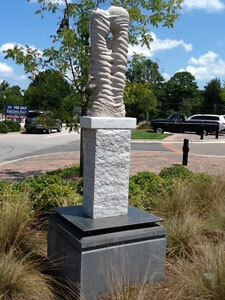 Paris was commissioned to create a monument for WakeMed's 50th Anniversary. 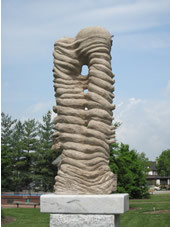 The Monument "Healing Hands" was dedicated on May 12th. Click here to see the 360 video. 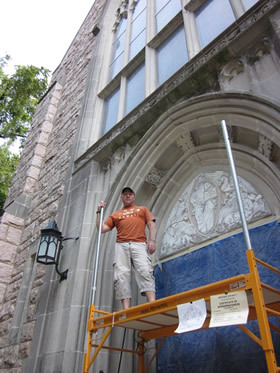 Click here to see the installation video. 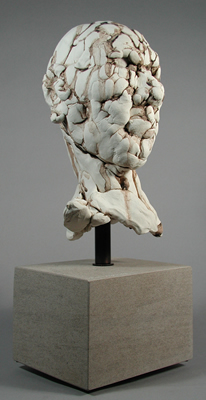 April 2011: National Sculpture Competition & Exhibition North Charleston, SC , "Nemesis"
Paris' work "Poet's Head" was chosen for the NCMA juried art auction. 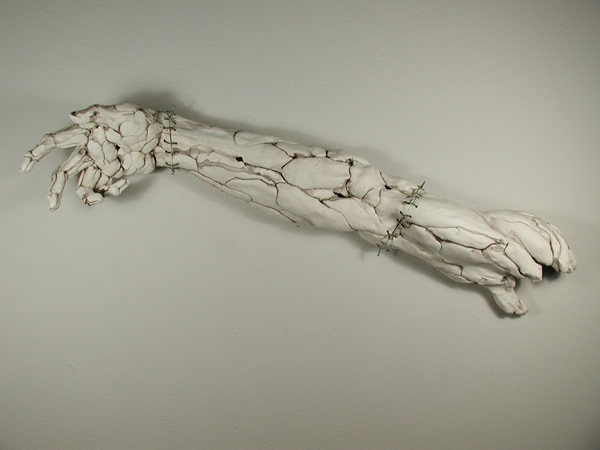 Paris' work "R. Mapplethorpe's Arm " recieved 1st Place in Sculpture. Juried by Peter Nisbet, formerly the Daimler-Benz Curator of the Busch-Reisinger Museum at the Harvard Art Museum, is now the chief curator of the Ackland Art Museum at The University of North Carolina at Chapel Hill. 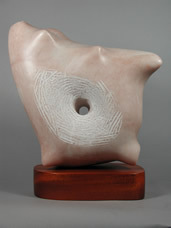 Paris' work "Portal VI" recieved the Award of Distinction. 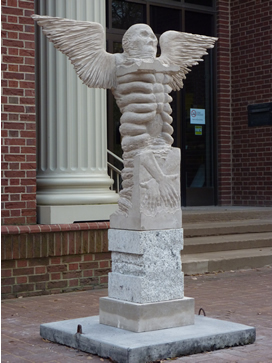 Juried by Melissa Peden, board of trustees member at the North Carolina Museum of Art and President of the Raleigh Fine Arts Society. 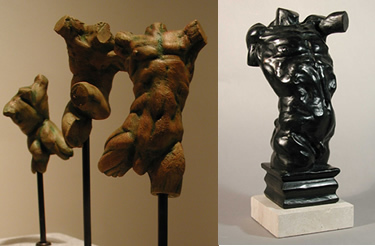 January 2011: Frank Gallery Presents 'Seeing the Figure' an invitational exhibition of contemporary work that is inspired by the human form which will include some works by Paris Alexander. The public is invited to the artists' reception on Jan. 14, from 5 to 7 p.m.
November 2010: Chapel of the Cross Commission Finished! 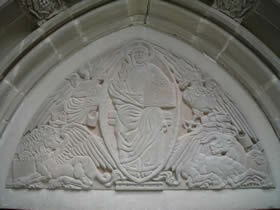 Paris has begun a commission carving the tympanium over the main entryway into the historic Chapel of the Cross in Chapel Hill. Click here for some details. 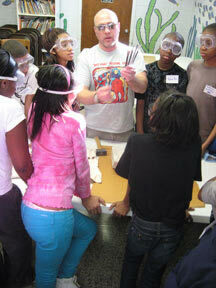 Summer 2010: Another successful year of workshops! 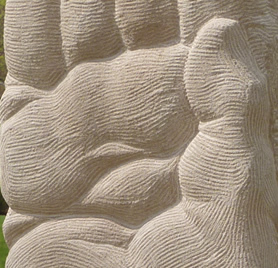 Click here to see a video of Hank Foreman's commentary on Paris' work. 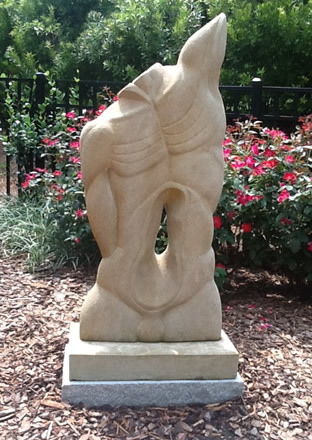 Sculptor Paris Alexander taught an art outreach program at the Governor Morehead School for the Blind as part of their celebration of 150 years of Arts at the school, produced a stone sculpture that is now permanently installed in the campus gardens. Click here to see a video of Paris' carving progression. -Jeff York, Public Arts Administrator for the Town of Chapel Hill. 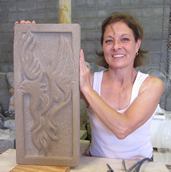 Check out the article in the Raleigh Downtowner about the stone carving workshop. Panther Creek High School Commission Completed! 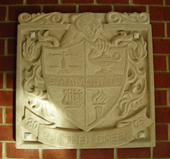 Panther Creek‘s first graduation class of 2009 has commissioned Paris Alexander to carve the school crest in limestone as a senior gift to the school. To be installed early October. Check out Heather McCuiston's Article on Paris. Paris Alexander is on London's Saatchi Gallery Online. 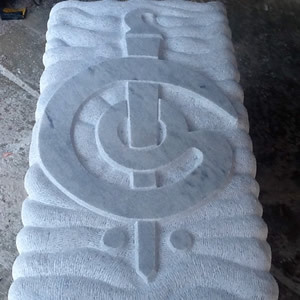 Paris Alexander was contracted by Warner Brothers Studios to supply a sculpture for the set of the upcoming Season 8 of the show One Tree Hill on the CW network. 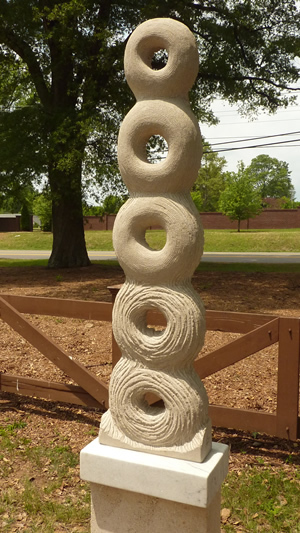 Sculptor Paris Alexander worked with 15 youths (3rd-6th graders) at the Salvation Army on Wake Forest Road, Raleigh, NC, instructing them in the carving of limestone sculptures, which are assembled into a permanent sculptural installation on the grounds of the Salvation Army. "Dr. Lawrence Wheeler our show juror mentioned that he’s known your work for quite some time” and that you “always achieve the mark.” Calling it “original” and “expressive,” he had the feeling that “there’s a figure in there, almost mummified, trying to get out, to live and breathe free.” He also mentioned how your carved striations in the limestone have great rhythm, “ saying, he loves “the technical inventiveness” with which you carve."